In high summer, the creek was the place to go. Children and adults alike would seek relief from the sun’s scorching rays by sheltering under the spreading canopy of giant river gums that grew along its grassy banks. Even in the driest and hottest of summers, when the sky was bleached white by the aurora’s intensity and the grass had turned to dust, the creek remained a lushly cool oasis. On those days, Pop would cut a watermelon and we would all sit on the shady creek bank and eat the fruit’s sweet flesh. After we had gorged ourselves, sticky faces and hands were washed in the pools of cool clear spring water that bubbled up through the sandy creek bed. It was considered a grand treat and we would passionately declare the creek far superior to the municipal baths in town. The only person who wasn’t seduced by its verdant beauty was our cousin Phoebe. She would always wave us goodbye from the homestead veranda. No amount of cajoling or teasing would get her to join us. Phoebe, had at one time been just as passionate about visiting the creek as the rest of family were; but that changed one afternoon in the summer of 1959. The shadows were already long when she and I came to the creek that afternoon. Dappled light played fitfully across the creek floor and a coolness in the air caused the fine hairs on our arms to rise. There is a majestic old gum tree, much taller than it’s surrounding companions that the family favoured as a reference point. A place to meet, leave towels and to eat our picnic lunch if we had bought one. The only time we didn’t use the tree was when Pop was with us. He would always move the party further along the bank, well away from the spreading branches of the old river gum, his reason being that old gum trees are notorious for casting off limbs without warning, thus earning them the rather morbid title of “Widowmakers”. It was too this old mammoth that Phoebe and I were headed. As we approached the tree, Phoebe’s clear bell-like voice fell suddenly silent, her long slim fingers sought my hand, the surprising strength of her grip pulling me almost to a halt. Breaking free, blithely unaware of her sudden caution, I continued to scramble up the the creek bank, my riding boots making a hard go of it in the loose sandy soil. It was her urgent cry demanding that I “Come back!“ that brought me to an abrupt standstill. Looking back, I could see her face. Luminously pale under its sprinkling of caramel freckles, the unruly medusa hair seemed to snake around head with a life all its own. “What’s wrong?” I asked with dawning apprehension. I turned to the tree but could see no one. Was Phoebe playing one of her famous teases? Her eyes locked with mine, their warning is implicit. This was no tease. “Come away now! This is a bad place.” The urgency and disquietude in her voice convinced me there was indeed something to be feared. And, as if we shared the one mind, we were off running, our long legs pumping furiously with the need to escape the darkly sinister confines of the creek and it’s towering gum trees. Back at the house, lounging comfortably and safely on the veranda, I ask Phoebe what she had seen down at the creek. She sits in an ancient squatter chair, one long thin leg draped over the armrest, the skirt of her dress shoved determinedly – for the sake of modesty – between her slim thighs. I know not to push too far or display undue vulgar curiosity. It will only serve to have her withdraw further into silence. With studied nonchalance, I voluptuously lick clean the pink fondant from an iced vo-vo biscuit. I feel confident my pretended disinterest will be the catalyst to trick her into a revelation. That was the last time Phoebe ever visited the creek. Erindale Station, the summer of 1910. The boy, whenever the opportunity arose would abandon his chores and escape to the creek. His favourite hide was the largest of all the big river gum’s that grew in profusion along the the creek’s banks. And with the agility of a monkey and the help of a rope, he would scale the side of the tree, coming to rest on the lowest of its many limbs..
Once there, he carefully hauled up the rope and stowed it out of sight in a deep hole within the tree’s trunk. A precaution against alerting anyone who might pass beneath as to his whereabouts. High up in the tree’s branches he could clearly see the house, it’s out lying sheds and the cattle yards. If he climbed to the highest point of the tree, he swore he could see all the way to town but that untruthful boast he made only to his younger siblings who had no way of disproving the vainglorious tease. It was from his eerie that he watched his father hitch the horse to the sulky. It was election day and his family were going into town to cast their vote and catch up with friends and family . An argument had erupted at the breakfast table that morning when he announced he wasn’t going to be a member of the party. His mother, worried and disappointed by his determination to stay at home and fearful of leaving an adventurous ten year old to his own devices, committed herself to loud and vociferous remonstration. The boy’s father, irritated beyond patience with the emotive and calamitous altercation, brought it to a swift and decisive end by yelling at the boy, “Bugger off you ungrateful whelp.”. 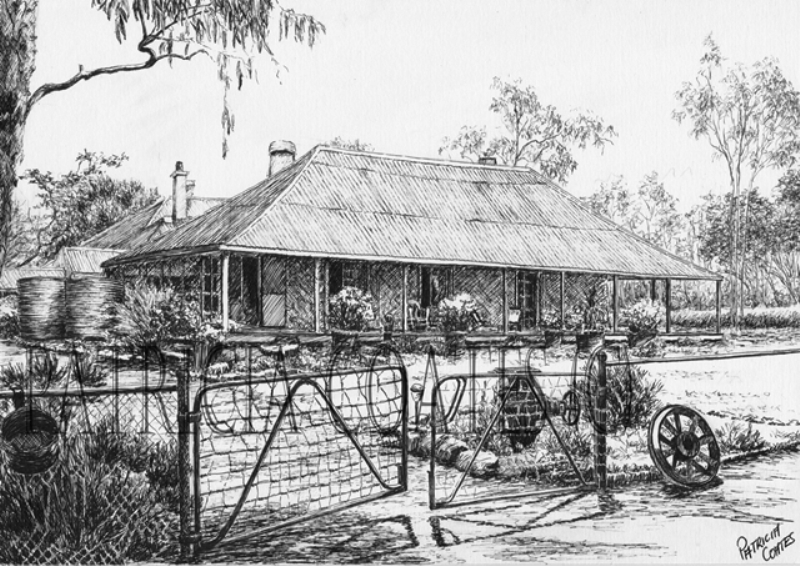 The boy stormed out of the house and made for the cowshed, removing the coil of rope from its peg and, careful to keep the straggling line of brigalow scrub between him and the homestead, he quickly made his way down to the creek. With his family gone to town, the boy felt both elated and saddened but he reckoned it was worth a fight with Mum to get time alone and to spend it perched high in his favourite tree. Little did he suspect that his decision to remain home on the farm that day was to have frightening consequences and change forever his attachment to his bolt hole: the giant river gum. Far below the boy, around the bend in the creek, a man is fleeing for his life. His gait is that of a man nearing exhaustion. With faltering steps he struggles through the boggy sand and shallow pools of water. Suddenly, before him a broad expanse of creek bed and a towering river gum, his lungs gasping for air, he staggers blindly toward the ghostly sentital. Unable to go any further, the man slumps at the tree’s base. Using its trunk to cradle his head, he pulls lantana vine over his supine body in a desperate attempt to camouflage his whereabouts. It’s so cool and quiet, the filtered light through the tree’s canopy causes mesmeric shadows to dance across the man’s closed lids. He mustn’t fall asleep; that would be fatal but exhaustion will have its way and finally he passes into a deep troubled sleep. In that nanosecond before dream becomes consciousness, when the dream accommodates reality, the man comes to a sudden wakefulness. He had been dreaming of his dog and miraculously the dog is before him, it’s intelligent eyes gazing adoringly at him. But the joy at seeing his dog is ephemeral, for beyond the wagging tail he sees the barrel of a rifle. His eyes track slowly along its metal grey length to the brown hand holding the gun, then continues upwards until finally coming to rest on the hard unforgiving face of his pursuer. He wants to cry out, beg for mercy. but a debilitating languor washes over him and he can do nothing except seek the loving eyes of his hound. Better to cross the river Styx with the image of his faithful dog leading the way than the merciless face of his executioner. A shot rings out causing a flock of galahs to wheel in fright, their raucous cries of alarm drowning an involuntary cry from the boy hidden high in the gum tree. Another gunshot rends the air! It echos through the shadowy confines of the creek bed then there is overwhelming silence. After A few moments, the sound of a shovel is heard as it slices through the sandy soil. Removing from the pocket of his jeans a battered tin of log cabin tobacco and tally-ho rolling papers, the old man hunkers down with the agility of a true bushman. The Cuban heels of his riding boots sink into the soft sandy soil of the creek bank. Resting his elbows on his knees he places a single cigarette paper on his moistened bottom lip and then delicately teases long strands of tobacco from the tin. In cupped palm I watch the long brown fingers slowly work the tobacco into a cylindrical shape. Satisfied, he removes the paper from his lip. Folding it into a trough, he then carefully places the tobacco onto it and begins rolling it back and forth until the recognizable shape of a cigarette is realised. Taking a match, the old man carefully pushes any loose tobacco threads that hang free, back into the body of the cigarette. Scrutinizing the rolly for any imperfections and finding none, he then pops it holus bolus into his mouth. I smile for I realize I had been waiting expectantly during this whole elaborate ceremony for this part of the ritual. As children we would cry out in surprised delight, ‘’Why did you do that Poppy?” ‘’Because it tastes good,” he would always answer. But later, as adults, we understood it helped moistened the paper and thus stopped it from burning too quickly. And so we sit in companionable silence on the creek bank, my grandfather and I, as he smokes his rolly and I allow my thoughts, unfettered, to drift back to the halcyon days of childhood. I, my sisters and cousins had so enjoyed this creek with it’s pools of spring water and the cooling though at times slightly menacing shadows. I recognise the tree at once. It was the majestic river gum the family used as a reference point, a place to meet or picnic under. It was also the same spot my cousin Phoebe swears she saw a ghost. I never felt quite the same about the place after that but unlike Phoebe, I kept coming down to the creek. Phoebe never set foot there ever again. But there was another member of the family who exhibited a curious reluctance to be in close proximity to that old gum tree. An observation given voice to by my cousin, the otherworldly yet perceptive Phoebe. It was indeed she who drew my attention to the family member’s particular avoidance of the gum tree. “Pop, I seem to recall you always gave that tree a wide berth. Whenever we all came down to the creek, you would encourage us to move further along the bank or set up over here on the opposite side. Why’d you do that?”. The old man says nothing. I can see his eyes, piercing through the veil of cigarette smoke. My grandfather holds fast my gaze for what seems an age but it is he who first breaks free, his eyes slide away, almost guiltily. I feel an odd compulsion to apologise, but for what? I was just speaking the truth. Intrigued, I knew to keep silent. To bombard the old man with shrill and intrusive questions would only serve to have him withdraw into total and enigmatic silence. I waited patiently as the old man painstakingly rolls another cigarette. A delaying tactic I suspect, to allow time for him to slowly marshal old memories to the fore. After clearing his throat and spitting a speck of tobacco to the ground he says, “It was the summer of 1910. I was a young lad the same age as the century …… “. Erindale Station, Summer of 1910. Galahs quarrel obstreperously in the giant river gum’s uppermost branches, mischievously dropping leaves and pieces of bark on the boy perched precariously below. He felt happy to be alone for it wasn’t often he had the chance for solitude. His family had gone to town early that morning and wasn’t expected back until late afternoon. It was a luxury to linger in the boughs of the old man gum. A wonderful opportunity to allow thoughts to drift far from the mundane world of clamouring siblings and the inconvenient demands of parents for chores to be done. The boy’s daydreaming is suddenly interrupted by the sound of a loud splash. His first thought is a falling limb from a gum tree had come to earth in one of the creek’s shallow pools, a common occurrence and of little consequence. But then he hears a loud groan, almost a sob, echo along the gully. “Someone was in trouble!” thinks the boy. But as a child of the bush, his natural instinct is one of caution. Better to stay still, remain hidden in the gum tree’s lush foliage rather than announce his presence and then find himself exposed to possible danger. He sees a man, kneeling in a pool of water. The man’s shirt is shredded and hangs in tatters about his heaving chest, probably torn as he fled through the sharp protruding branches of the noxious lantana bush that grew in wild profusion along the creek bank. Climbing to his feet the man staggers on, towards the tree that hides the alarmed child. The man’s mouth is an open maw as he fights for breath. He struggles up the bank and falls, exhausted, at the base of the big old gum. The frightened boy waits as still as death but then, after some minutes of quietude from below, curiosity exerts its seductive power. The boy surrenders to the sirens call and slowly eases himself along the limb of the old gum, until he is directly above the supine man. The man, an arm flung over his eyes appears to be sleeping. He has pulled lantana shrub over his body in an attempt no doubt to camouflage his resting place from anyone who should pass by. This alerts the boy: the stranger below is a fugitive and possibly a desperate one at that, and therefore, more than likely to be dangerous. The boy climbs higher into the tree’s canopy and wedges his narrow buttocks firmly into an accommodating fork. With his back pressed firmly against the tree’s trunk he feels relatively safe. Time passes and the gentle swaying of the tree along with melodic birdsong becomes a beguiling lullaby, causing the boy to drift into sleep. It was the urgent bark of the dog that startles him to alert wakefulness. Anxiety and fear immediately clutch at his heart. Through the shifting eucalypt leaves he can see a tall man carefully scrutinizing the banks either side of the creek as if searching for something or someone. A stockman’s hat obscures the newcomers face. He cradles a rifle in the crook of his elbow and at his side, a blue cattle dog strains impatiently against it’s lead.. The boy is certain they’re looking for the man asleep at the bottom of the big gum tree. His suspicions are confirmed when the dog drops it’s nose to the ground, sniffs explosively and then bounds forward barking, dragging the man with him. The dog has found the fugitive’s scent. Man and dog scramble up the embankment and then are lost from view, obscured by the tree’s lower branches. The boy intuitively feels something bad is about to happen. He hears a voice speak softly, “Here you are!” The voice could belong to either of the men. Then the shocking sound of a rifle shot reverberates around the creek. Frightened galahs take to the wing, screeching in noisy alarm, their vociferous protest drowning the boy’s involuntary cry of fear. Another shot and then there is silence so profound the boy is sure his pumping heart can be heard by the man far below. Then to his mortifying shame, he feels a spreading warmth radiant from his groin to his upper thighs; so acute is his fear, he has wet himself . An aeon passes or is it just minutes? The boy can’t tell . Movement across the creek causes the terrified lad to cleave even closer to the tree’s protective trunk. It’s the man returning, he leads a horse and is carrying a shovel. Silent tears course down the boys face as hears the sound of a shovel slicing through the sandy soil of the creek bank. He knows the murdered man’s final resting place is at the base of his treasured tree. But he also weeps for the loss of innocence and the understanding he is forever changed; from this moment on he will carry an awful burden, a secret that he never dare share with another. I stare at my grandfather in appalled silence. The poor man has been burdened all his life by this terrible secret. So many more questions I want to ask . We were near the homestead now and I needed to ask one more question: “Pop, who was the murdered man and why was he killed?” The old man slows his pace, “Dunno boy for sure, but I reckon more than likely a cattle thief. In those times you didn’t bother so much with the law. You took it into yer own hands”. My grandfather puts his arm around my shoulders in a rare display of affection. I can smell his familiar scent, tobacco, pears soap and sweat. “Let it go now boy. You don’t want to be bothering other folk with that old tale.” So with shoulder to shoulder, we ascend the verandah stairs and the welcoming clamour of the family.